Teachers use a variety of strategies to help students through this high-activity time of year with holidays, assemblies, absences, field trips, etc. Every class needs some structured practice time to accommodate these schedule changes and allow teachers to work with small groups. Math games are a wonderful resource for this hectic time of year as students play in pairs or small groups to practice math facts and skills. Teachers may easily differentiate the practice to best meet the varied needs of learners. Choose games to provide distributed practice of math facts or skills, such as coordinate graphing. Games used in conjunction with data collection also help students develop the important concepts of probability as they analyze the data they collected and formulate conclusions based on that data. The simplest primary games may easily be used as data collection activities for middle school students who still enjoy holiday activities. 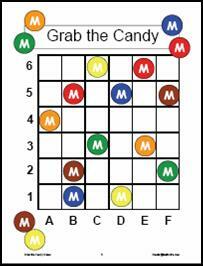 Check out the Mathwire Grab the Candy Game which develops coordinate graphing skills as students try to win the most candy. Use this game in conjunction with the M&M data collection activities commonly used throughout the year. 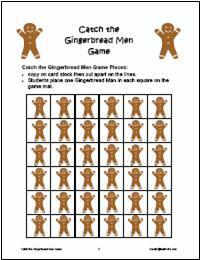 The Catch the Gingerbread Man game also practices coordinate graphing skills. The Mathwire Run, Gingerbread Man, Run Game was designed to introduce younger students to the randomness of spinners [pictured at left] and dice. 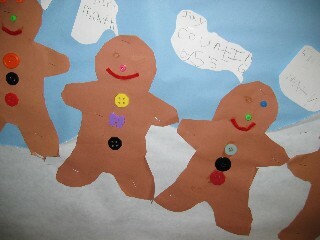 Although each gingerbread man has the same probability of winning, students will experience the randomness as they play. Data collection is built into the game to facilitate class discussion of results. Look through all of the Mathwire Seasonal Math Activities for more winter math activities and games. Be sure to also bookmark the Mathwire Math Games collection as a resource for math games organized by math standards. The Winter 2005, 2006 and 2007 collections include activities to address math standards and integrate with seasonal themes. Teachers will find games, math-literature connections, data collection ideas, and internet links to additional winter math activities. There's something for every classroom in these collections! Check out the Mathwire Seasonal Math Activities for links to the Winter Math Activity Collections. 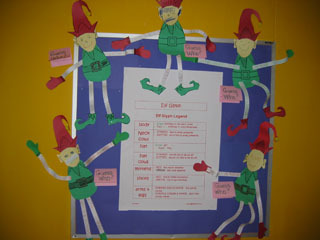 Download the legend and patterns for the Elf Glyph, pictured on the right. This collection of Gingerbread Man Math Activities includes Mathwire.com activities from the Winter 2005 and Winter 2006 collections: links to gingerbread man glyphs, math-literature connections and links to gingerbread man collections on the web. The collection also includes several new Mathwire activities: measurement activities, gingerbread man math mats, gingerbread man graphing ideas, two new gingerbread man games and some new gingerbread man problem solving tasks. Check out the Gingerbread Man Math Activity Collection for activities and games to enrich your classroom celebrations of gingerbread men and gingerbread houses during this holiday season. 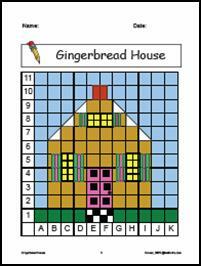 Remember to include the Gingerbread House coordinate graphing activity from the Winter 2005 collection for seasonal practice of coordinate graphing skills. Pair this activity with any of the coordinate graphing games to help young students develop basic graphing skills. Students place M&M markers on the numbers 2-12. Students may place one M&M marker on each number or place several on some numbers and leave other numbers blank. Next, students toss two 6-sided dice, find the sum, and remove an M&M marker from that number, if there is still one. The first player to remove all markers wins the game. NOTE: This game was developed by Susie Siegel who currently teaches fourth grade at Irwin Elementary School in East Brunswick, NJ. 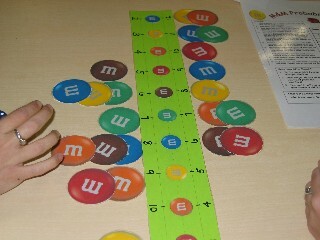 Ms. Siegel created M&M markers on the computer and used sentence strips for the gameboard, as pictured. She also designed a recording sheet students could also use to play the game and record data. Read more about the M & M Probability Game, then download the student recording sheet, directions for using the recording sheet, and data analysis discussion questions. Many teachers include a weekly "Game Day" in math classes. On this day, student groups cycle through activity centers that include games to develop fact fluency and/or practice important math skills. This day also typically includes small group instruction centers where students meet with the teacher(s) for remediation or enrichment. Including this regularly scheduled "Game Day" is a win-win strategy for teachers and students as it provides opportunities to differentiate instruction to meet the varied needs of learners in any math classroom. If this is not a regular part of your classroom instruction, consider adding this day during December on a trial basis. You may be surprised at how much you and your students learn on this Game day. As the saying goes, What we learn with pleasure, we never forget. Read more about Basic Facts Fluency for additional suggestions and strategies. Check out the Mathwire Who Has? Activities Collection for Who Has? decks ready to download and print out on labels for use in your classroom. Some students need prompts to help them write mathematical expressions for target numbers. Climb the Ladder is an activity that prompts students to move from all addition or subtraction problems and include many mathematical topics to generate equivalent names. The student starts at the bottom of the ladder and completes the first rung using the prompt provided. He/she then moves up to the next rung, etc. and works to complete as many rungs as possible in the allotted time. The teacher may also include a traditional name-collection box for students to use after they reach the top so that they continue to generate equivalent expressions of their choice. Many students write more diverse mathematical expressions as a result of using this prompted approach. Read more about using Climb the Ladder as a regular number sense activity and download templates for student use.